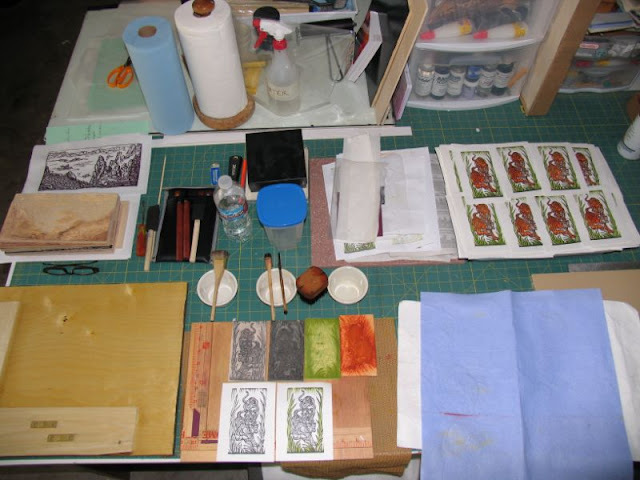 One of the things I'm enjoying most about doing moku-hanga is the "compactness" of the whole process. I thought I'd share the arrangement of my printing desk (also doubles as mat-cutting desk, framing desk, doodling surface, cat bed and various other things). At the left top, the Valley of Fire II blocks all cut and ready for me to get the courage to print bokashis. Just below, one of my registration boards, close ups and more details below. Front, center, the brushes and ceramic cups I just used to print my tigers; blocks laying on anoher registration board. Just to the right, bottom, that blue cloth is an auto drying cloth (faux, synthetic chamois) which I dampen and put inside a Tupper-ware (plastic with tight-cover) flat container. I keep printing paper in there throughout the printing process and stays nice and evenly dampened for as long as I keep the lid closed. During printing, I take the entire stack of paper, place in a plastic bag with another of those dampened synthetic chamois. I then pull out a sheet at a time, print, and then place in the plastic container. Works well and I have had absolutely no registration problems...well, other than "operator error" when placing the paper down on the registration board. Behind the whole setup, to the right of the paper towels, a set of small stackable plastic drawers. There are four drawers in all and I keep pigments on the larger bottom drawer, paste and brushes in the next one up, barens and more brushes next, and miscellaneous printing containers and other paraphenalia in the top drawer. My entire supply of woodblock printing "stuff" right there in that portable little set of drawers and they are see-through plastic so they are protected from dust and cats and I can readily see what's in them. Registration boards in the next post!